KATOWICE, Poland, Dec 14 2018 (IPS) - It is close to curtain call for the United Nations’ Climate Conference in Katowice, Poland, with ministers from around the world negotiating the text for a “rulebook” to implement the historic 2015 Paris Agreement for climate action. Amidst the various issues being debated, one of the most technical and complicated is Article 6 of the agreement, which focuses on the country plans for climate action. While the world has been having climate conferences since 1992, the tide turned with the Paris Agreement when all countries agreed to play their part to undertake climate action. “Developing countries now have a strong political will to contribute to the greenhouse gas reduction,” said Hyoeun Jenny Kim, Deputy Director General at the Global Green Growth Institute (GGGI), an international organisation that promotes balancing economic growth without harming the environment. This political will was manifested in Paris with countries voluntarily submitting their Nationally Determined Contributions (NDCs) for reducing carbon emissions and building climate resilience, taking into account their respective circumstances. 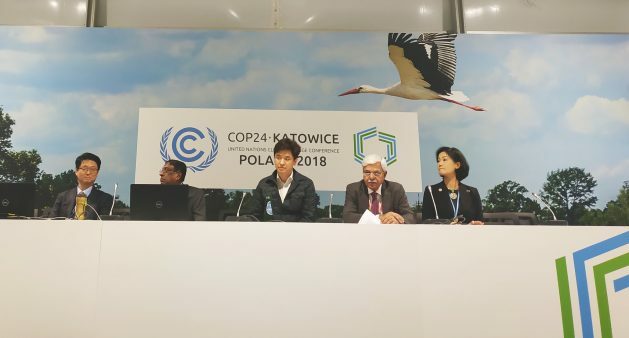 “But at the same time, they need support to affectively implement their NDCs,” Kim said, at a side event at the 24th Conference of the Parties to the United Nations Framework Convention on Climate Change (COP24), which was organised by GGGI and focused on transparency and NDC implementation. In order to get support from outside, Measuring, Reporting and Verification (MRV) of a country’s carbon emissions reduction is almost a precondition as many donor agencies and even private sector organisations want to know how much greenhouse gases a developing country is emitting before they make a decision to support it. “MRV is key for developing countries to get access to financial, technical and capacity building support, and that’s why we are supporting developing countries to set up more proper and internationally acceptable MRV scheme,” Kim said. GGGI’s interventions in this area include preparing a low emissions development strategy for Fiji, Colombia’s national green growth strategy and Mongolia’s national energy efficiency plan. The organisation is also working on building capacity to implement MRVs in various countries around the globe, including, Mozambique, Senegal, Nepal and Laos. “We will continue to support our members and partners in their efforts of effectively implementing NDCs with robust MRVs, so they can access more finance,” Kim said. One of the speakers at the panel was Ariyaratne Hewage, Special Envoy of the President on Climate Change, Ministry of Mahaweli Development and Environment, in Sri Lanka, which is on track to become a member of the GGGI. He said Sri Lanka anticipates extensive support from GGGI in the years to come for its preparation of various project proposals to fight climate change. “The present situation in Sri Lanka is severe droughts in one part of the country and heavy floods in another,” Hewage said. During a 2016 survey conducted by the Bonn-based NGO Germanwatch, Sri Lanka was awarded the fourth place in terms of climate vulnerability. “We are severely affected by climate change, so we are very keen in developing climate change programs to ensure these problems are properly addressed,” Hewage said. The proposed emission reduction i.e. mitigation targets of Sri Lanka’s NDCs include 30 percent reduction in the energy sector and 10 percent reduction in transport, industry and waste by 2030. “For energy and transport sector we already have developed MRV systems, but for the other sectors – industry, waste, agriculture, livestock, forestry – we need help,” he added. The need for support was also stressed by Ziaul Haque who leads the Bangladesh delegation’s COP24 negotiations on Article 6. “Our main issue is lack of capacity to address this enhanced transparency framework under the Paris Agreement at both the institutional level and the individual level,” said Haque, highlighting the need for accurate data. “We need to bring data on green house gas emissions from different institutions and whether they are collecting and archiving the data in the right manner is an issue that needs to be looked at. In this regard our institutional arrangement is not very strong at the national level,” he said, stating that strengthening the capacity of institutions and individuals who will be dealing with the transparency issue is crucial. Rajani Ranjan Rashmi, a Distinguished Fellow at The Energy and Resources Institute (TERI) and former Special Secretary of India’s Ministry of Environment, Forests and Climate Change, said at the side event that one of the fundamental issues to deciding a transparency framework is that of flexibility. Moreover, whether the same guidelines regarding MRV of greenhouse gases should be applied to all countries is also an issue of contention at COP24, he added. Jae Jung, Deputy Director of the Greenhouse Gas Inventory and Research Center (GIR), another panelist at the side event, said having common metrics and structured summary is crucial. “At this moment we don’t have the final text of the Paris rulebook, but we do have a very clean text of the common metric with no bracket, so there might be agreement on that,” Jung said. “In terms of global stock take of emissions we don’t have to have a common metric in our inventory. But when we do the global stock take every five years there has to be someone doing the conversion applying the same common metric to all countries’ inventories,” he added. He also stressed the importance of “structured summary” – a form of presentation of aggregated presentation of data that makes it possible to see the level of carbon emissions of one country – stating that helps to avoid double counting issue. One way to address the multifaceted challenges to NDC implementation would be through engagement of the private sector, according to experts. “Many people think Article 6 of the Paris Agreement is about the market itself, but it is about increasing cooperation,” said Dr. Suh-Young Chung, Director of Center for Climate and Sustainable Development Law and Policy (CSDLAP). “If you look at the Paris landscape to meet the 2-degree Celsius temperature target, you realise it is not enough and you need to bring in private sector investment. And countries need to work together on this,” he said, adding that Article 6 eventually needs to promote cooperation with the private sector, via incentive mechanism to engage businesses and addressing the risks they face. “Article 6 is about bringing more opportunities for developing countries, but to do so, you need MRVs first,” he said.